American manned rescue spacecraft. Study 1960. 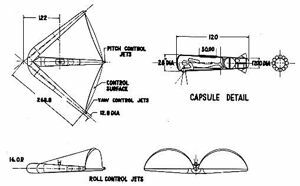 FIRST (Fabrication of Inflatable Re-entry Structures for Test) used an inflatable Rogallo wing for emergency return of space crew from orbit. Status: Study 1960. Gross mass: 407 kg (897 lb). Height: 6.50 m (21.30 ft). Span: 9.05 m (29.69 ft). 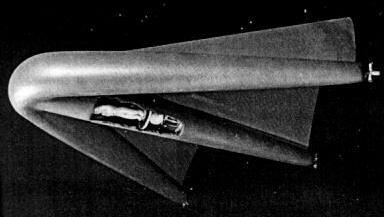 In the early 1960's Aerojet studied project FIRST (Fabrication of Inflatable Re-entry Structures for Test) in order to evaluate the use of inflatable Rogallo wings for emergency return from orbit. The system would be stowed in a cylindrical package, docked to the external surface of a space station. In an emergency the escaping crew member would enter the coffin-sized cylinder, seal the back hatch, and be blown free of the station. The paraglider would then inflate and deploy. The crew member would use a gas stabilization and control system to orient the spacecraft for retro-fire, and then to keep the glider at the correct attitude for re-entry. From a 600 km circular station orbit re-entry would occur 26 minutes and 11,800 km from retro-fire at an altitude of 110 km. Computer studies indicated that minimum heating would occur at a re-entry angle of - 1 degrees, an angle of attack of 70 degrees, and a lift to drag ratio of 0.5. The resulting trajectory was found to be practical under automatic or manual control. G loads during re-entry would not exceed 2.0 G.
The paraglider would reach transonic speeds at an altitude of 43,000 m. From here its subsonic lift-to-drag ration of 8.0 would give it a 345 km range to reach a landing point. Landing speed would be 55 kph; a flare just before touchdown would reduce the horizontal velocity to 9 kph. In the event of a loss of control or failure of the parasail after the peak heating point of re-entry, yet another backup mode was available. The capsule could be separated from the parasail. Once it hand dropped below 9,000 m altitude, the crew member could blow the capsule open and then descend under his own personal drogue + main parachute. Material for the glider used an ultra-fine filament super alloy wire fabric impregnated with elastomeric silicone matrix material. Typical thickness was 1.5 mm except along the stagnation line surfaces where the amount of silicone was increased to double the thickness. Internal pressure of the inflatable required to maintain shape throughout re-entry was only 0.7 bar. Family: Space station orbit, US Rocketplanes. Country: USA. Agency: Aerojet. 1960 During the Year - . FIRST (Fabrication of Inflatable Re-entry Structures for Test) - . Nation: USA. Spacecraft Bus: Rescue. Spacecraft: FIRST Re-Entry Glider. Aerojet project to evaluate the use of inflatable Rogallo wings for emergency return from orbit. The system would be stowed in a cylindrical package, docked to the external surface of a space station. In an emergency the escaping crew member would enter the coffin-sized cylinder, seal the back hatch, and be blown free of the station. The paraglider would then inflate and deploy. The crew member would use a gas stabilisation and control system to orient the spacecraft for retro-fire, and then to keep the glider at the correct attitude for re-entry.